Taza makes chocolate that’s a little different from most. While many chocolate makers spend days on end refining and conching their products, Taza prides itself on being unrefined. The organic, Direct Trade cacao is stone ground using Taza’s hand-carved granite millstones. This method produces chocolate that’s bold in flavour, gritty in texture, and seriously more-ish. This festive limited edition is an expression of Taza having taken its signature stone-ground 60% and flavoured it with ginger, cinnamon and a whole load of warming spices. 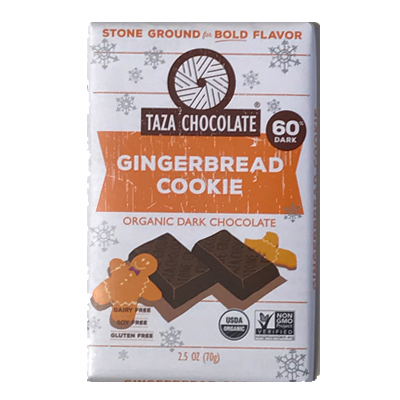 This Gingerbread Cookie Bar combines 60% dark stone ground chocolate with cinnamon, ginger, and a gingerbread cookie crunch.